Considering a New Build Construction Home? DO NOT sign or fill out an information card with the Builders salesperson. By filling out this card or providing them your contact information in anyway YOU WAIVE your right of representation as the salesperson ONLY acts in the builders best interest. This means you will not be allowed to have an experienced realtor represent you. DO NOT make this mistake as a Realtors service to YOU is FREE, can SAVE you Thousands, prevent you from losing your earnest money or even worse ~ a Lawsuit. If you want to convert your current property to a Rental / Income Property, you will receive discounted fees on our FULL-SERVICE Property Management Services. This includes education on becoming a landlord and ultimately a small business owner. Contract review, Expert Negotiation on your behalf, and a Full-Service Realtor Experience. It’s FREE – That’s right. You do not have to pay a dime. 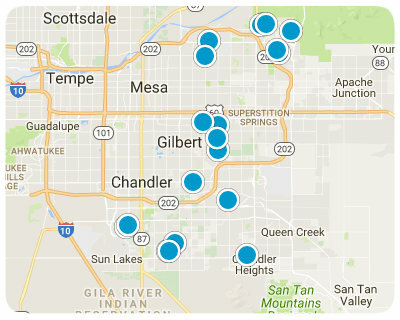 In Arizona, the builder / seller has to pay all commissions. Options Expertise – It is easy to get caught up in all of the excitement of building your home and selecting options. More often than not, buyers over improve their home and never recover. While to some this may not seem like a big deal, it can be financially devastating. I can help educate you on which options to splurge on. Financing Education – Are you getting the best rate? I work directly with multiple lenders to help my buyers secure the best rate possible. While most builders offer an incentive to use their financing company, it may not be worth it in the long haul. I can help you identify the break-even point of incentives to insure you are getting the best rate and incentive package available. Contract Review – The contract can be confusing. It gets worse when builders add in all of their additional materials like waivers and addendum's. This is a legal contract so it is important to have an experienced real estate professional on your side educating you throughout the process. Negotiations – The sales office personnel do not make final decisions and they ONLY work in the builder's best interest. However, there are specific ways to go about this process to get more for your money. It is important to have an experienced real estate professional to negotiate on your behalf. Inspections – You can have a new home inspection done before you move in to your home. This would help you avoid any potentially dangerous or expensive situations that might have been over looked. I can recommend a quality home inspector. Must Sell to Buy – In today’s market many are taking advantage of the low interest rates and looking to either up-size / downsize via a new home purchase. Unless you plan on selling first and staying with family and/or a short term lease, you have to enter the world of contingencies. While most builders do not accept contingencies involving the sale of a home, they can be negotiated and yet you could still lose your earnest deposit.Not only will I help you sell your home at a discounted fee, but I will help negotiate a scenario and time table that is realistic.